Whatever spontaneous storm may come our way I plan on loving my wife. If you truly love someone (and they truly love you), commit to that love and plan on it being hard work. My wife and I have known each other since high school, but didn't date until much later. We had only dated a couple of weeks before we realized that we were madly in love and wanted to get married. I felt deflated. "We're so different," I said. "You like to plan, while I like to be spontaneous." Kim's eyes widened. "I can be spontaneous!" she said, hurriedly. "I can totally be spontaneous. You just have to tell me in advance when you want to be spontaneous, and I will write it down in my planner..."
Funny as it may seem, the more I think about this conversation the more I've come to realize that planning to love someone--or choosing to love someone--is actually one of the most beautiful things about love. I've heard it said that real love is an unconditional commitment to an imperfect person. When all the butterflies have fluttered away and your wedding day becomes a distant memory, you will discover that you've married someone who is just as imperfect as you. And they, in turn, will come to learn that you have problems, insecurities, struggles, quirks--and body odor--just as real as theirs! 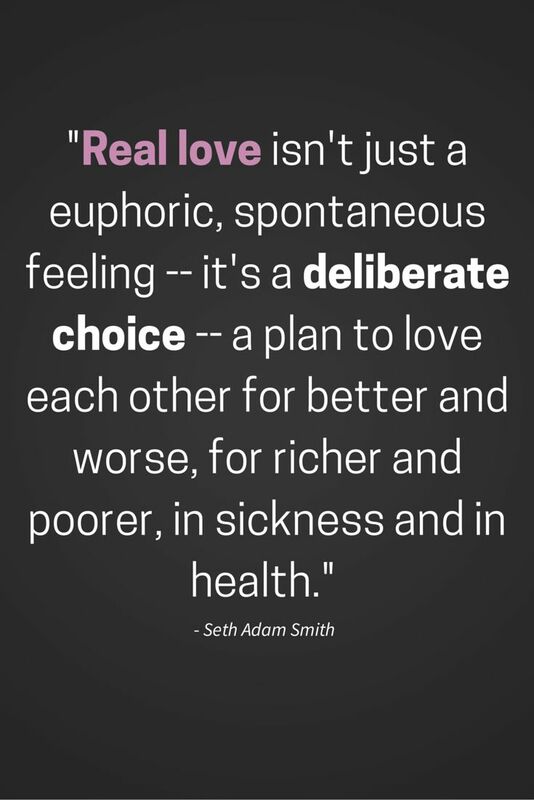 Then you will realize that real love isn't just a euphoric, spontaneous feeling--it's a deliberate choice--a plan to love each other for better and worse, for richer and poorer, in sickness and in health. Of course, you don't choose who you're attracted to, but you definitely choose who you fall in love with and (more importantly) who you stay in love with. Besides, life already offers us plenty of spontaneity: rejection, job loss, heartache, disappointment, despair, illness, and a host of other problems. We simply can't abandon ship every time we encounter a storm in our marriage. Real love is about weathering the storms of life together. When my grandma was in her fifties, she was diagnosed with multiple sclerosis, a degenerative disease that disrupts the body's ability to communicate with its nervous system. Within a few short years, Grandma had lost the ability to walk and was confined to a wheelchair. Grandpa, who was then the chief of police, retired two years earlier than planned in order to take care of Grandma. He helped her do everything--from getting around the house and visiting the doctor, to helping her take her medicine and bathe. In speaking about my grandma, Grandpa once told my mom, "It hurts me to see her like this. You know, when I got married I thought that everything would be smooth sailing. I never imagined that I would have to help her change her catheter every day. But I do it and I don't mind it--because I love her." Love is so much more than some random, euphoric feeling. And real love isn't always fluffy, cute, and cuddly. More often than not, real love has its sleeves rolled up, dirt and grime smeared on its arms, and sweat dripping down its forehead. Real love asks us to do hard things--to forgive one another, to support each other's dreams, to comfort in times of grief, or to care for family. Real love isn't easy--and it's nothing like the wedding day--but it's far more meaningful and wonderful. I recently came across this wonderful quote: "No one falls in love by choice, it is by chance. No one stays in love by chance, it is by work. And no one falls out of love by chance, it is by choice." Whenever my wife and I run into a problem in our marriage we do our best to choose love. While we're certainly not perfect, the love we share today is more real and more wonderful than anything we had ever anticipated.